All network administrators would like to have a dashboard to measure and monitor in real-time the SLA of our links even when these links interconnect buildings which are many kilometers far from each other. In addition, we would like to configure our MAN (Metropolitan Area Network) easily from an online web page where we could connect several buildings, which are in different cities, on demand with just a few clicks. This is the goal of Metro Ethernet Forum (MEF) since 2001 where telecommunications service providers, network equipment/software manufacturers and semiconductors vendors are working to define common standards for implementation of carrier ethernet services for facilitating the deployment of ethernet services worldwide. It is a Ethernet Private Line (EPL) or Ethernet Virtual Private Line (EVPL) to connect two sites with a point to point EVC (Ethernet Virtual Connection) from one UNI to another UNI (User Network Interface). It is like a Frame Relay leased line but “cheaper” and more efficient for the service provider. We can build this kind of services with VPWS (Virtual Private Wire Service). It is a Ethernet Private LAN (EV-LAN) or Ethernet Virtual Private LAN (EVP-LAN) to connect multiple sites each other with a multipoint to multipoint EVC from one UNI to another UNI. It is a service which works as a switch between each site. We can build this kind of services with VPLS (Virtual Private LAN Service) or TLS (Transparent LAN Service). It is a Ethernet Private Tree (EP-Tree) or Ethernet Virtual Private Tree (EVP-Tree) to connect one major site to multiple sites with a rooted multipoint EVC from one UNI to another UNI. It is a service with a hub and spoke architecture which is useful for broadcasting and multicasting services. It is an Access Ethernet Private Line (Access EPL) or Access Ethernet Virtual Private Line (Access EVPL) to connect one service provider to another with a point to point OVC (Operator Virtual Connection) from one UNI to an ENNI (External Network to Network Interface). It is a service to connect customers through different service providers. 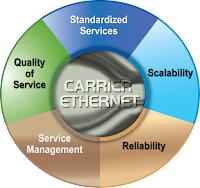 This is an overview of the services standardized by MEF but most of us are wondering about what is about eavesdropping in the carrier ethernet service provider? what is about MAC tables in this kind of layer 2 networks? what is about Spanning Tree? And all of them are issues that we discuss in another post. Regards my friend and remember, the network are growing even more! !